Presently I am in Ireland for a short vacation. I arrived here on St. John's Day, December 27th, barely avoiding the storm. Compared to New York, the mornings here are much darker, as we are much further to the north here in Ireland. Dublin was quiet on my arrival and the country still seems to be in a bit of a daze. Listening to the morning news as I drove down to Limerick, the two main items of news were: 1. Newly released government papers from 30 years ago claim that a Sinn Fein TD presently in the Dail, was strongly suspected by the British secret service of being involved in the murders of at least 50 people in both the North and South during the IRA campaign. 2. The Attorney General at the time had very strong reservations about the wording of the Pro Life Amendment to the Constitution, which was later passed. In retrospect the Attorney General's strong reservations have proven to be correct. The whole question of abortion has again become a major issue here in Ireland. The weather here at present is good, but I am told a big storm is on the way during the weekend. I was asking people how the country was doing. Many businesses and hotels and hostelries have closed, and the new dwelling house tax looms next July. People are experiencing much hardship yet they are very stoical. 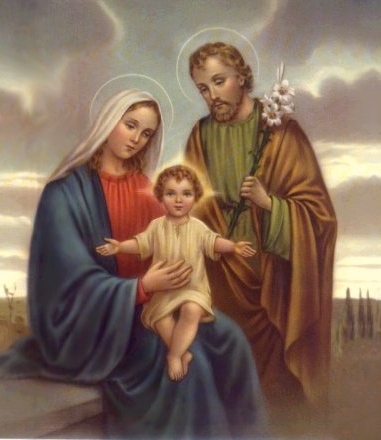 Sunday December 30 is the Feast of the Holy Family. I really like this feast. The readings are so family oriented. The Gospel story from Luke of how the twelve year old Jesus got lost in Jerusalem shows that misunderstanding can occur even in the best of families. Mary and Joseph had brought Jesus to introduce him to his obligations to the law. They went to celebrate the Passover. Jesus was learning what it was to be a good observant Jew. But as Mary and Joseph set out on the return journey Jesus got left behind. The parents were frantic, as being a small boy lost in a big city was serious. So began a frantic search and having failed to find him among their fellow pilgrims, they returned to the city to look for him. They could not understand why Jesus would cause them such anxiety. But as all parents know a child does not stop being your child when he/she causes you worry. Nor do you stop being a parent. It is easy to love children as babies, when all they need is attention and smiles. It becomes harder to love them when they begin to assert their own will as tweens and teens. When a child hovers too closely around his parents it may not be a great sign. It often shows insecurity. When a child is sure of it's parent's love, he/she forgets the parent’s love and goes out to explore the world. That is what happened to Jesus. He wasn't really lost, but was having an adventure. He knew he was in the Temple, the house of God. When he met his parents and Mary asked him: “Son, why have you done this to us? Your father and I have been looking for you with great anxiety." He answered then, a bit flippantly, “Why were you looking for me? Did you not know that I must be in my Father's house?" Mary and Joseph must have kept their peace, but his answer worried Mary. I know that if I had done the same thing to my mother and father as a child, I would have been fearful of the consequences. The moral of the story is that family life can be difficult, and it demands much wisdom on the part of parents in trying to cope with the daily problems both large and trivial of family life. The example of the Holy Family can encourage many parents who have to cope with difficult children. The second Reading of Sunday's Mass is from Paul's letter to the Colossians. Paul encourages the people to be better Christians. God's chosen people must put on heartfelt compassion, be holy and beloved, have kindness, gentleness and patience, bearing with one another and forgiving each other. If one has a grievance against another; as the Lord has forgiven you, so you must do also. Over all these put on love, and let the peace of Christ control your hearts, and be thankful. Family life is a daily struggle and Paul must have seen the struggles of the Colossians in trying to live out this life. We are called to be a holy-not a perfect-family. The big question is: What does it mean to be a holy family today? So I wish you all a very "Happy and Holy New Year 2013". God bless you all.